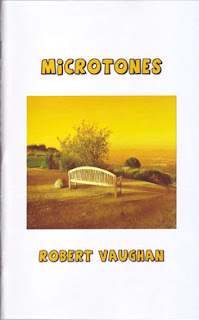 I read Robert Vaughn's Microtones while sitting halfway up a mountain in Connecticut. At first, this detail seemed insignificant; I read books all the time while sitting along West Rock's trap-rock ridge. (I'm currently unemployed. So.) But, as I read on, I found a possible parallel between my experiences hiking through New England and Vaughn's work. And I’m not just talking about the fact that the cover of Microtonesfeatures an empty bench atop a mountain. My favorite moment on a hike is reaching that first scenic vista. Generally, a good vista comes after some effort and provides a nice panoramic scene where I can look out onto things both familiar and unfamiliar. The ultimate feeling I get, sitting there, looking out over a city or a valley or a rural countryside, is that of both significance and insignificance. I feel insignificant and small because I am sitting on volcanic trap rock that was part of Pangea, whereas I've only been around for thirty years and have still yet to start a career. But, I also feel significant in these moments. There is the wonderful sensation that comes with inhaling the fresh air, with seeing a beautiful, lush and green valley, or watching a red-tailed hawk catch a current or feeling the sun on a cloudless day. When there is that much beauty before me, it's hard not to feel a little hopeful. It's a somewhat bleak start--the holidays prove to be difficult because the poem's speaker is isolated in some way, and in fact, always has been. But Vaughn isn't one to drop in some darkness and then hightail it. The poem's final line is this: 'There's something I forgot.' It’s a miniature detail but it injects a small bit of optimism into the piece. The sentence seems to imply that there is still something left. In saying 'There's something I forgot,' as opposed to 'Something has been forgotten,' hope lingers, at least for a little bit, the hope that the ‘something’ may be found. "That was awful what happened to him," Mom says, stirring more butter into her mashed potatoes. "It was his own fault," Dad says as he chews, mouth full of t-bone steak. own, by her own stupidity. (24). It's an intriguing idea to work over, the idea that death is in a person's hands, which seems like the ultimate form of isolation. If death is a direct consequence of something the dead had done, then that implies that the death was a sort of helpless act, one with no recourse. True isolation. it off broil. Then I forgot to turn the oven off. The day does not lend itself to night. My mind has flown. It's gone from the everyday. No one's watching the oven! (32). Reviewer bio: Jake Goldman is a writer and adjunct professor. He lives in New Haven, Connecticut.